Break the link between employment and healthcare! The US Supreme Court ruled along political lines on the 30th of June, 2014 that “closely held corporations”, over 90% of all US businesses, are now free to discriminate against women (and it was specifically women and birth control) if their religion leads them to believe birth control kills babies, or that women who use birth control are Satan’s spawn (the belief does not have to be factual). The other, more ubiquitous discrimination is in the notion that the health care you get has anything to do with the work-for-pay arrangement you have with the organization you work for. I am probably the millionth person to mention this, and whole books have been written on the subject, but, the link between healthcare and your employer is wrong because it anchors discrimination. This particular egregious case goes one step further and discriminates based on gender as well, not just work status. The US had a chance to sever health benefits from employment when they had a three-year debate on expanding health insurance coverage. Thanks to the ability of small political minorities to filibuster and block action, and a corporate-funded reluctance for change, the US kept their employer-based health insurance system in place, and with it, all the discrimination that entails. Uwe Reinhardt reiterated a number of these points recently in the New York Times. The health insurance tax or MSP (what our government cutely calls a “fee” in order to not call the yearly increase in this fee a tax increase): Many employers will pick up part/all of this tax for their employees, whereas one that doesn’t can pay more than 1000 dollars a year for a family. While there is an element of progressiveness to the pricing with very low-income people paying less/nothing, it is weak, families making > 30K per year pay full price. Drugs: For some reason, drugs are not covered by our “universal” healthcare system and are provided by workplace “supplemental benefits”, as if taking a thyroid pill every day is a “supplement”. The CCPA makes an excellent case for universal pharmacare, if you need more convincing. 10% of Canadians cannot fill prescriptions for financial reasons. Our public health insurance system assumes people don’t have eyes or teeth. So, if you want your cavities filled, a root canal, or want to see clearly, you need “supplemental benefits”, and these are mostly employer-provided. Oral health is a clear marker of health inequality. Mental health is not covered, this is inexcusable, as Andre Picard notes. Treatments that improve overall health, like massages, are not really covered. Once again, your employment status determines whether you have the “luxury” of holistic preventative measures to reduce stress, pain, and many other issues. Historically and currently oppressed groups, Canada’s indigenous people for example, get a short shrift on the benefits like massage, nutrition, counselling and holistic treatment they need because of disparity in employment availability. This quote from the Andre Picard article I mentioned summarizes the discrimination. The well-to-do pay. The middle-class scrape together the money the best they can, sacrificing so their child can get care. And those without the means wait, or do without care. There are other side-effects. Because “benefits” are expensive, companies have a vested interest in only having certain “valuable” employees benefit. The rest get treated as contractors, have their hours strategically reduced, and much more. It’s almost as if there’s an unspoken moral argument here, you don’t deserve good teeth or a massage if you don’t work for a living. Yes, you can buy individual supplemental insurance, or pay per use, but neither of these are cheap because you as an individual have no bargaining power. A simpler system with one buyer is administratively efficient. It takes the thousands of decision points every HR administrator or group in every company/union has to make and transfers that to a single entity. Public universal plans are about four to ten times more efficient (pdf) than fragmented private plans. A bigger entity can negotiate much better rates for you, whether it is for drugs, or for dentistry, or for anything else (a bigger risk pool). If all of Canada administered one simple pharmacare system, we would negotiate much lower prices with pharmaceutical companies. We would also have better funding to run and evaluate effectiveness studies. Funding preventative, holistic healthcare means fewer hospital visits. In a universal system, there are no artificial barriers between a massage, drug treatment, surgery, stress reduction counselling, or ergonomic counseling for back pain. You don’t have to prove your work injured you in order to get the right treatment, your first point of contact with a medical professional (not necessarily a doctor) decides which path works best. You do not have to get sick enough to go to the hospital before you get treatment covered by insurance. As Vox points out, if a government administering the single-payer system decides not to pay for contraception, then no one gets it. So, getting good universal healthcare is about constantly winning political battles. The good thing about universal healthcare in Canada is that it is incredibly popular, polling near 90% approval (pdf). So once quality is improved, governments will find it hard to cut back. Will employers raise wages from all the savings they get from not providing health benefits, and will these raises cover the increase in taxes we will pay for universal healthcare? Probably not right away, but it will happen eventually. We would also need to rethink the”fee for service”, where healthcare providers are paid per widget, and think about a different system closer to a salaried model, more on that in future blog posts. I have been MOOC’ing this summer and learning how to do maps. Geography as an adult is much more fun than my 10th grade geography class. 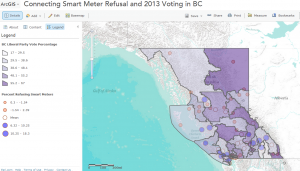 Chad Skelton over at the Vancouver Sun intrigued me with his data retrieval and mapping of British Columbia’s Smart Meter uptake. if you’re not from BC, here’s a short intro (#BCpoli-aware feel free to skip the next two paragraphs). BC Hydro is the government owned (Crown Corporation) utility that produces and distributes electricity for the province of British Colombia in Canada. In 2011, BC Hydro announced its intention to spend $$$ upgrading all its electricity meters to “smart meters”. These meters are capable of being read via wifi by meter readers, and potentially also give BC residents the ability to monitor their electricity usage in near-real time. Many concerns were raised about the smart meters. One was about the costs of the program vs. perceived benefits. The others, which gained traction were around an emerging movement in BC connecting wifi, cell signals and wifi-enabled smart meters with a whole variety of health effects. While few, if any of these health concerns have been actually causally linked to smart meters, or even to the amorphous descriptor “wifi radiation”, these health concerns have gained traction even among official bodies such as the Union of BC Municipalities, municipal councils and school boards. The BC provincial election in 2013 was a chance for people to voice their concerns. The opposition parties all brought the issue up during canvassing. For my peer assessment mapping project, I wanted to see if areas of relatively high smart meter refusal were correlated or co-located in any way with voting against the ruling BC Liberals. This is the map I made, my first ever map not scrawled on paper. The electoral districts are colour-coded by BC Liberal Party percentage, darker means higher vote for the BC Liberals. I chose this rather than “who won” because I was looking more for an anti-BC Liberal effect. I will, at some point in time, try to overlay “who won” as well. The smart meter refusal data is in three different coloured and sized circles. Large and red means higher refusal, and small and green means low refusal. This is a hybrid of a graduated circle symbol scheme and a diverging colour scheme. Clearly, using points to represent areas is a big limitation, but it is sufficient for a quick peek. Places of higher than normal refusal tended to vote against the BC Liberals. I believe this had more to do with existing anti-BC-Lib tendencies influencing smart meter refusal rather than the other way around. Urban centres like Victoria and Vancouver had relatively low rates of refusal. Is this because of higher apartment proportions, or because smart meter refusal was restricted to a small number of high information, highly motivated individuals whose number varied by location and whose numbers in places like Victoria were muted by larger populations?. Note that my home area of Victoria had the most (7300) rejected smart meters, even though the percentage is small. The ageing white (l)iberal enclave of Saltspring Island (Ganges), aka hippieville, Canada had by far the highest refusal percentage. So, is this smart meter refusal map mostly a hippie population distribution map? The take home message for me was that the anti-smartmeter movement had little influence on the election, which was most likely won on the usual and mundane issues of the economy, trust and corruption. The data from BC Hydro is categorized using their division of BC into distinct geographical billing areas. I used billing area names to geotag the information. The site http://www.findlatitudeandlongitude.com/ has a feature where addresses can be uploaded in bulk via a text interface, and the site returns the place, and latitude longitude. I added province and country to the place names, and edited ambiguous names to make the search more effective. Elections BC lists 2013 provincial election results information by party by district. However, there is no publicly downloadable mapped source for the election data results. I used the open source GIS desktop software QGIS to open the shape file and add the attribute of BC Liberal percentage to the shape file. I uploaded this shape file to arcgis and layered it with the smart meter refusal rate graduated circles to look for patterns. Maps are fun to play with, and I know very very little about them, which is a great combination. Every minute I spent making this map was a learning experience. Comments and feedback, please. I think I will slowly incorporate mapping into my skill set. 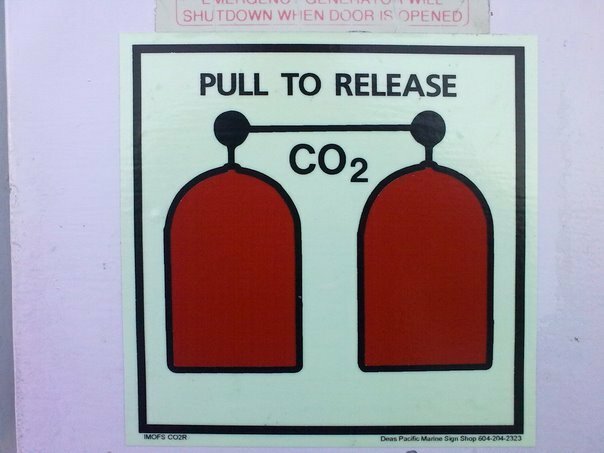 But I think I will use open source/free solutions in the future.